I've run half a dozen trials while I learn how to do PID tuning. 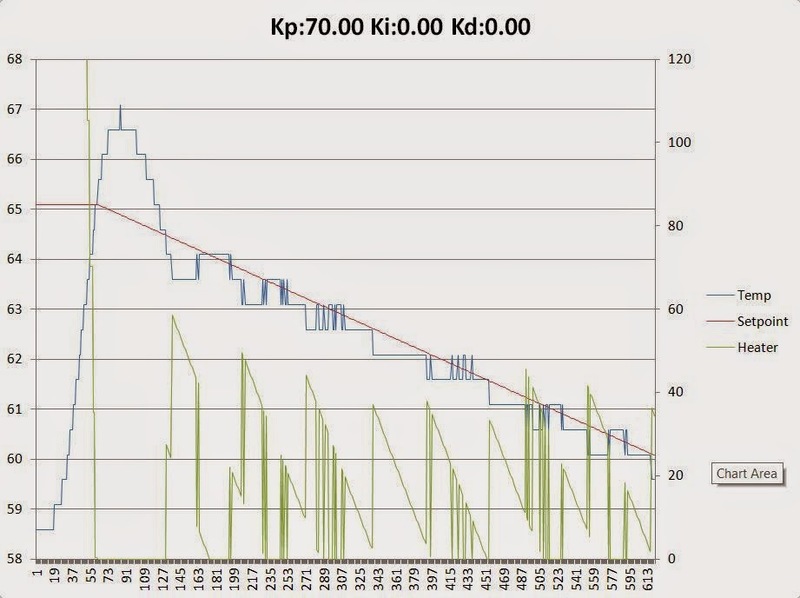 That image is from part of the process where I'm looking for a good Kp that doesn't overshoot. After playing with it for a while I decided that I might as well get the rest of the hardware and software done, then play with the fine tuning later. The code I've been using to run the temperature controller for the crystal chamber so far has been pretty bare, just the core PID loop. I don't have it tuned yet, but it's generally functional, so it's time to start getting it in shape to be an appliance. 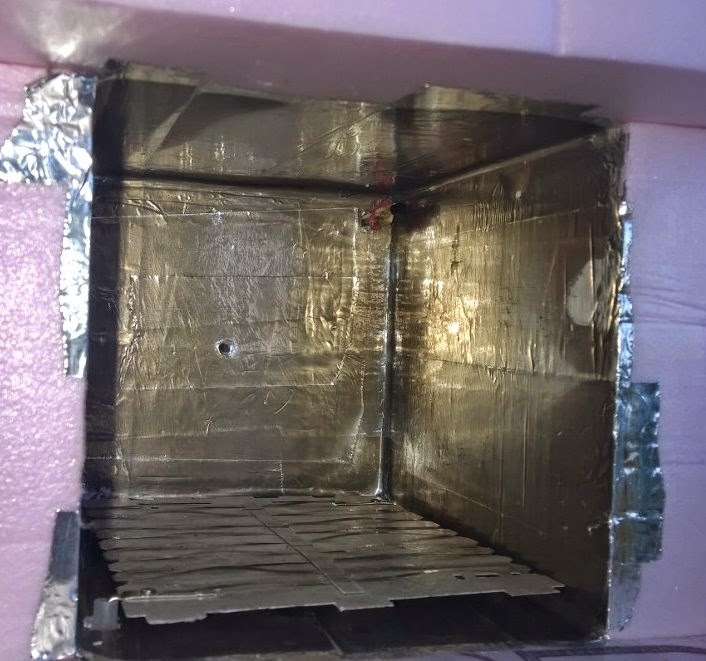 The box has a nice power cord and switch built in, so I will be able to just stuff everything inside and put a connector on the back for the heater and temp sensor wires. Then I can use different chambers depending on what size I need. I could also run set it up to run multiple chambers, it only takes a couple more pins to run additional chambers, so I suppose I could set up to run about three. Maybe for version 2. I wired it up for the LiquidCrystal library, plugged it in and away it went. The controller is only good for 8 characters, so I've got it set up to cycle the display through each setting one at a time. Right now, that's the setpoint temp, the current temp, and the number of seconds left in the ramp. I also noticed that at some heater PWM frequencies the power supply squeals, so I added start and end cycle beepers. When I switch power supplies I'll probably need to add an actual beeper, but this was kinda fun in the meantime. It's there at the bottom of the image. I used poly tube standoffs to keep the leads from contacting the aluminum tape and to provide a relatively stable mounting to the foam. The temp sensor is in the upper right-hand corner. Previously it was just laying on the floor of the chamber. Keeping it up in the warm air rising off the heater helps the response time, but also makes it clear that there's some pretty strong stratification going on in there. I'm pretty sure I'll need to add a tiny fan to keep the air mixed. I didn't want to do that because of the possibility for vibration to affect the crystals, but if it does end up being necessary I can probably isolation mount it somehow. Or maybe I should use an ionic wind type fan. Every project needs some nice high voltages, right? 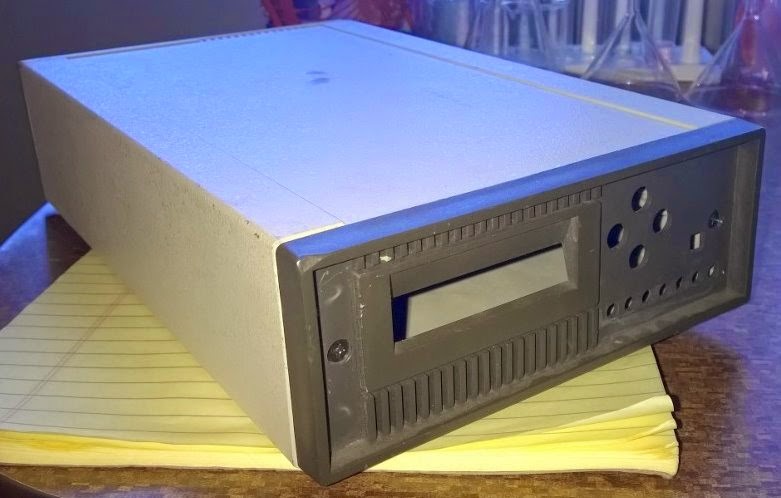 The next step will be to scare up a new power supply that'll fit into the old modem box and come up with a connector for attaching the chamber. 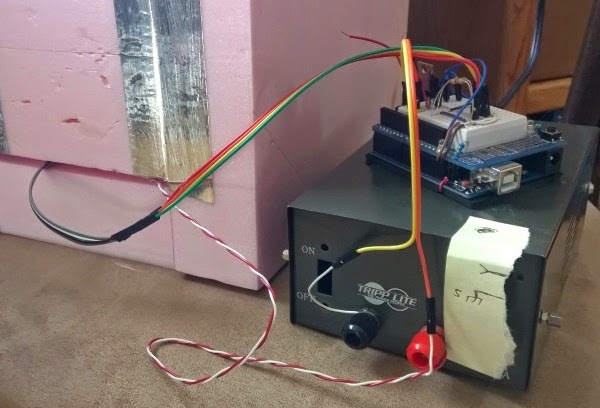 I cobbled together a simple temp controller to try to get a feel for what it'll take to make one that will work for my temp controlled crystal-growing chamber. For this first iteration I've just got a simple PID-controlled heater, LM75 I2C temp sensor, and a 25W heater element. For now I'm just running on an Arduino and a crappy bench supply (with a way-too-bright power indicator). For the finished project I'm thinking I will use aÂ Teensy 3.0Â as I've got some samples of them that I'd like to do a write-up about. To house the controller I'll be repurposing an old modem that has a front panel with a small LCD and a set of buttons that I can use for menu navigation. I can mount a power supply and all the electronics inside and put a connector on the back that plugs into different chambers. This big chamber will be nice for large beakers, but I'd like to have a smaller one for test tubes. I can put a resistor on the chamber side of the connector so the control box can identify which chamber is connected and select the appropriate PID tuning. I ran this for a few hours to see how it behaves. The 0.5C resolution on the sensor is pretty bad, but overall the results were encouraging. 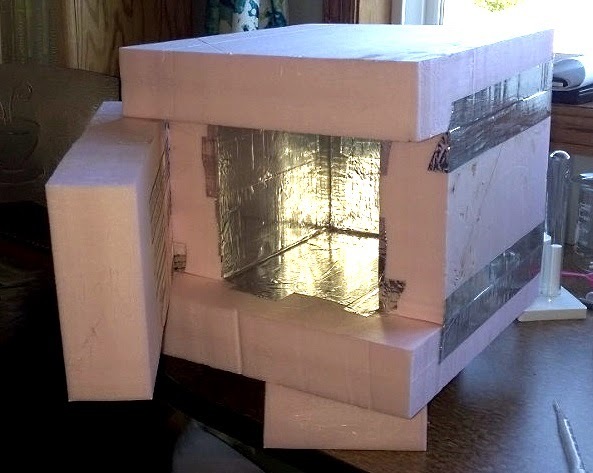 I don't really care much about how it handles large rates of change, since the hot solution will go into a preheated chamber. The main concern will be whether it can hold a stable downward ramp with minor fluctuations outside the chamber. I haven't tested that yet. 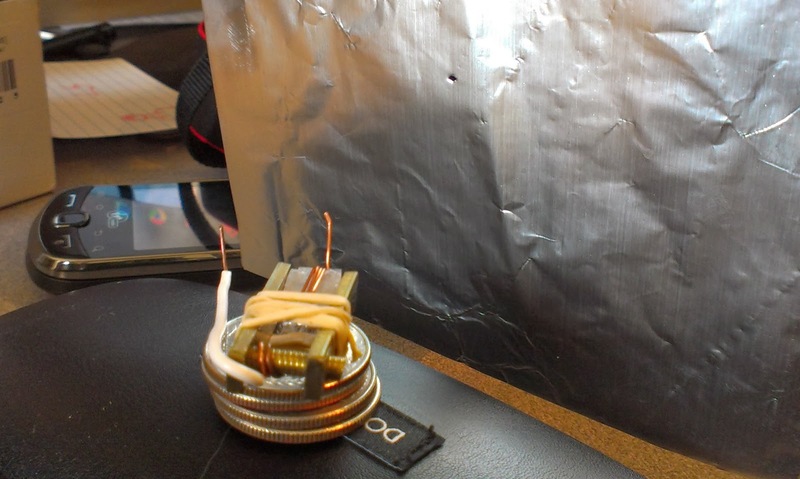 Next step is to get the heating element mounted so it is stable and out of the way and then test with a beaker of hot water so I can see how well it do temperature ramping. I'm pretty sure I'll need to upgrade to a higher resolution sensor for really long ramps, but for a day or two this 0.5C should be ok if I screw with the PID tuning enough. The PID library has some kind of auto-tune that looks interesting, but I haven't figured out how to use it yet. The foam is rated R-10. I'll put a liter of hot water in this and log the rate of change to get an idea of how much it reduces heat loss over open air. That should give me an idea of how much power I'll need the microcontroller temperature controller to handle. I'd like to be able to keep it as low as 0.1degC per hour while minimizing fluctuations, but at this point I don't have any idea how challenging that will be. Recently I've been playing around with growing crystals. 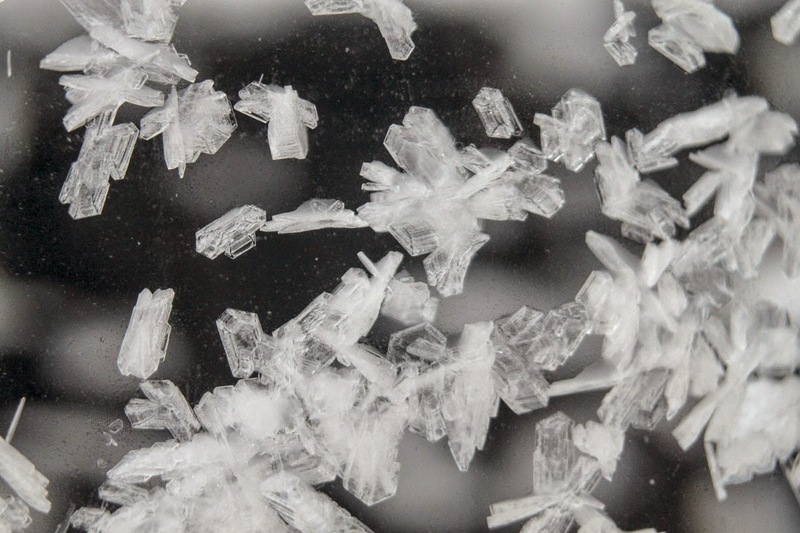 It was always a fun and easy thing to do when I was a kid, so I thought I'd try some that are more interesting than the usual salt, sugar, alum, epsom, etc. This is recrystalized acetylsalicylic acid, asprin, from OTC tablets. 10g pulverized, washed with cold water, vacuum filtered, then dissolved in 250mL of 75C water and allowed to cool slowly. Crystals approximately 3-5 mm in length. I will chill this and allow crystal formation to finish, then wash the crystals and recrystallize at a slower rate. This is benzocaine, extracted from Oragel tooth gel. 0.5g of gel stirred in 15mL cold water until dissolved. 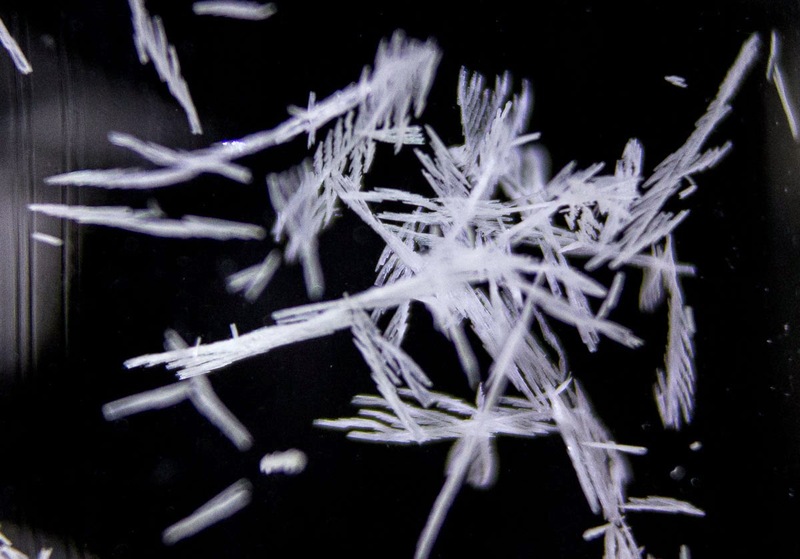 Benzoncaine will form white flakes. Centrifuge and draw offÂ supernatant. Add 20mL water and heat in hot water bath. A bead of molten benzocaine will form. Add sufficient water to dissolve the bead. Allow to cool and crystallize. Vacuum filter and collect for recrystallization. This is what I think is probably salicyclic acid. 1g of OTC tablets, pulverized, heated in 20mL water until dissolved. When cooled the entire 20mL formed one huge crystal block, which was amusing. Melted again, added 10mL water and heated until acetic acid formed. 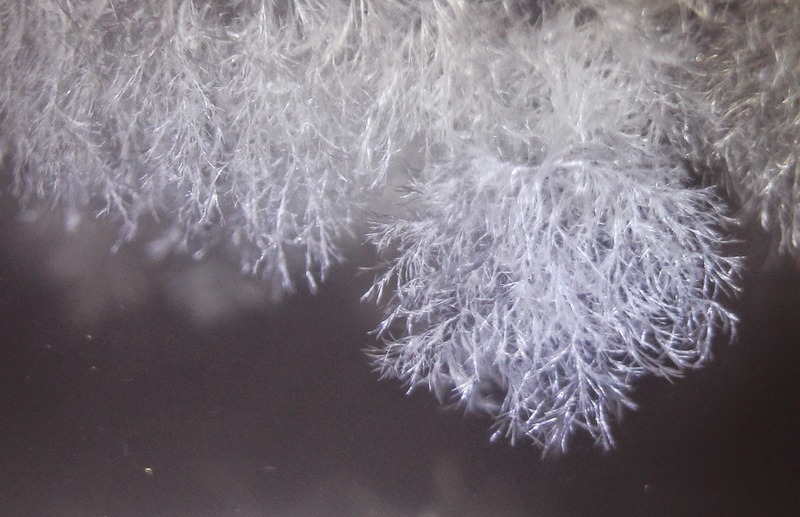 Cooling produced fine, hair-like crystals, which I suspect are salicyclic acid (more research to do). Washed and vacuum filtered, will recrystallize to see if more pure crystals look different. A friend from the Omaha Maker Group gave me an interesting chip a while back. Apparently it is some kind of optically sensitive chip, it has a clear case. I thought it would be interesting to take some macro photos of it and see if I could capture some of the details of the die. I started out with just some simple shots with the kit lens and extension tubes. Easy enough to see, but lighting was difficult with the chip as close to the lens as it was. You can see the wires and a little detail of the chip, and the lighting in this one gives a nice shadow on the wires. I then switched to my long telephoto lens, extension tubes. This let me move the chip back from the lens a few inches, which made getting light in much easier. It didn't produce an image that was any more magnified though. The chip is about 2.5mm on the short dimension. From here I added a 10X macro expander lens and also a 10 triplet hand-lens to see if I could get any closer. This was difficult because it's a separate lens and can't easily be mounted on-axis with the camera lens. With a little fiddling around it came out ok. I can see a lot of details, though it's starting to get fuzzy around the outside, only the middle is relatively free of aberration. Here's a crop from that image. In the original photo the 2.5mm chip is a bit over 1100 pixels across, giving about 2170 nanometers per pixel. The narrowest traces are about 4 pixels wide, about 0.0003 inches. I'm not sure what the aperture was set to, but this is probably not bad performance for a first attempt. I'll have to do some reading and set up my equipment a little more carefully and see if I can sharpen this up a little more. Edit: with a little more fiddling I got it down to 580 nanometers per pixel. Pretty sure I can take it farther, but I need to set up something to handle adjusting the sample position for fine focus. It's pretty fiddly. Also need to get some bright light onto it so I can see it in the live view. My dim desk lamp doesn't really cast enough light for this. 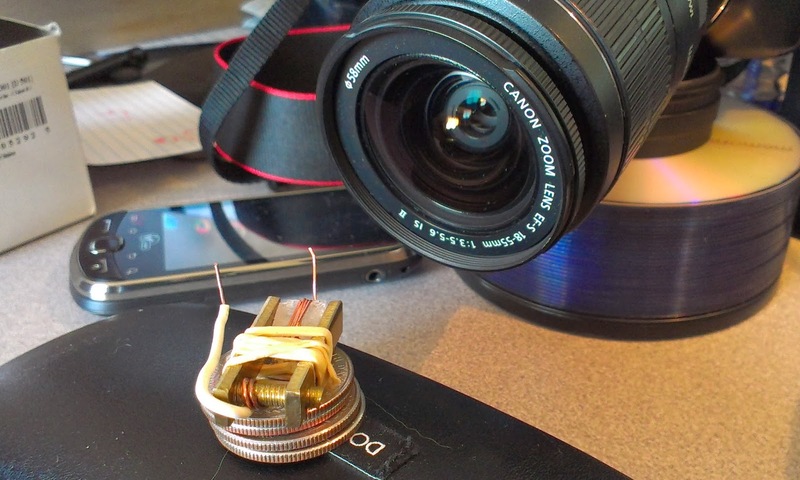 I was curious why a large aperture on a lens reduces depth of field. To investigate this I set my camera up with a macro extension tube and a subject with lots of depth. This image shows a very short field, as is typical with macro photos that are taken from very close to the lens. The focal plane is about 10 degrees off of perpendicular from the surface of the coins, and intersects the subject about where the copper wire wraps around the crystal. 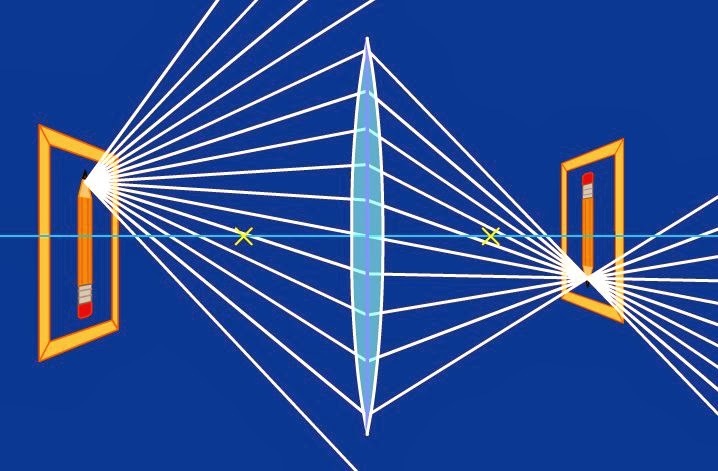 From any given point on the subject on the left, light passes through every point on the lens and is focused onto the camera's sensor. If you imagine a tiny bug with an equally tiny camera walking around on the big lens and taking his own pictures of the subject, you would noticed that depending on where he was standing, his photos would each be slightly different, sometimes from a little higher or lower, or one side or the other. We can simulate the bug camera photos by taking a picture through a pinhole placed in front of the lens. It's hard to tell in the still images, but the perspective is different in each shot, the angles all change a bit as the bug walks across the lens. It's easier to see this if you user a bigger hole so that you get a full-frame image instead of the circular shot, but it's harder to see the increase in the depth of field. Here is another example with a slot to let in more light. Left side from the top of the lens, right side from the bottom. Since the tiny bug camera can only collect a tiny bit of light with each photo, all those slightly-different photos will be quite dark. If we stack them all up to increase the brightness, we get the image we would get from the regular-sized camera. It's a bright, but only the parts that were all the same in the individual images will still look sharp in the combined image. The parts that were all slightly different will be all mixed together, making them appear blurry. That's exactly what the big lens is doing, stacking together thousands of different perspectives of the view all taken at the same time. We could get deeper depth of field in the image by using a smaller aperture, but that makes the image darker. To compensate we can increase the light on the subject, leave the shutter open longer, or use a more sensitive sensor. 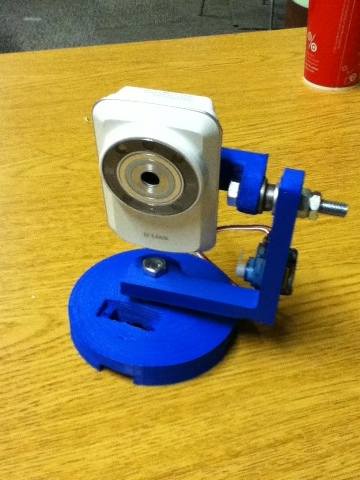 With some help from Brandon and Ben I got the mechanics for the pan tilt camera rig going. 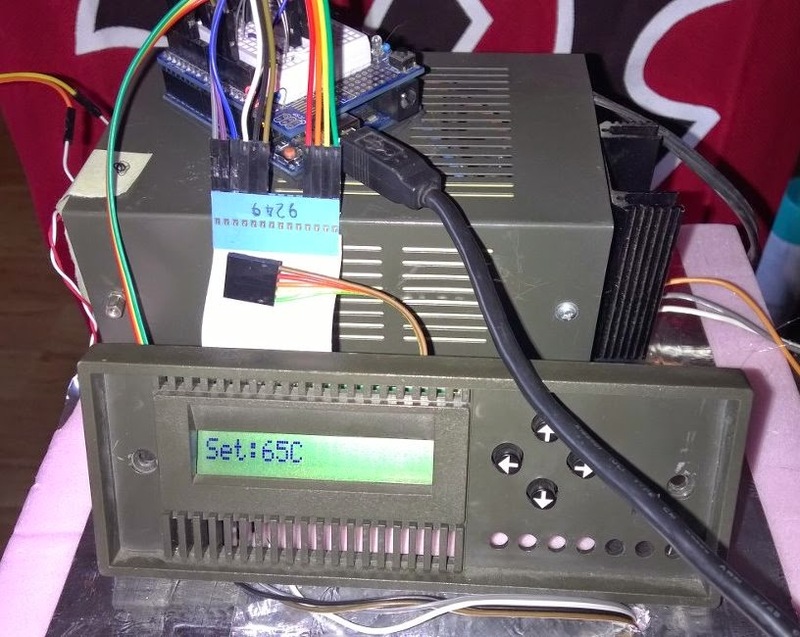 The servos attach to an Arduino which is connected to a computer running a Windows web service that provides access to the camera. I had an issue with the movement speed initially, and had to update the Arduino code with some position speed ramping. That went well and it is moving more smoothly. It flops around a bit, but I think that is mostly the slop in the mechanism. The web service supports tagging of positions so that interesting views can be labeled. Once labeled a single button press takes the camera back to the associated position. I will post some video of it in action soon. Here are a couple of videos of the tippy forge I've been working on for the Omaha maker Group. At this point it just needs the frame to hold it and a handle to make it easy to tip. There is a little leakage from the input that we need to get sealed up, but it works quite well so far. One of the interesting projects from the Omaha Maker Group meeting on Jan 10. Ben put together this little motor demonstration rig with a couple of magnets, a 3D printed frame, and the armature from a commercial motor. Here he is just holding a couple of wires against the commutator as brushes. It's interesting to see the effect of adjusting the brush positions relative to the magnets.